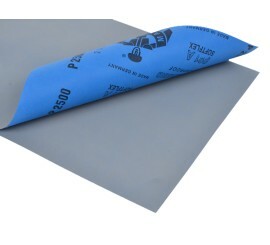 Abrasive paper designed for manual wet sanding. It can be used anywhere where the highest quality of sanded surface is required. Special, elastic and impreganted paper that is resistant to tearing, has anti-slip structure and does not require long-term soaking. Binder made of synthetic resins provides an optimal protection against grains peeling off. Sharp silicone carbide grain is evenly distributed in closed fill ensures exceptionally sharp and even abrasion of the surface that gives ideal base for base lacquers and topcoats. Paper gradation ranging from P2000 to P5000 is designed for polishing and and removal of topcoats.